Who said running your own business or managing your own team would be easy? Most people I interact with, whether CEOs or managers, function in at least one role as an entrepreneur. I compiled the top actions to which they credit their success, so that I can share them with you. You’ll notice that they are all actions because moving forward is the most important element of running a successful operation. Don’t be reckless, but you must make bold moves sometimes. Caution is important, but beware of too much circumspection. Any growing business will require risks on its path forward – make sure you choose the risks with the most potential for reward to cost ratio. One of the biggest challenges leaders face is letting go of certain tasks they should no longer be doing. But tying your time up with things that others could do will only hold you back. Learn to delegate, choose the right people for the right positions and make it your personal challenge to train them well at the tasks you pass along. Penny pinching seems to be a wide-spread attitude as well as a reality in the years since The Great Recession. It’s an admirable change in many ways, and I encourage you to be cautious financially and eliminate unnecessary costs. However, don’t be afraid of spending money on development. It takes money to make money – trite but true. Mistakes are a part of life and business, and you will inevitably make them. What matters is less the mistake and more that you learn from it. In addition, you have to learn to move on from your mistakes. Dwelling on the mistake will not make you a better businessman – dwelling on the lesson will. Some days you may want to conquer the market in your field, while other days you may feel burdened just maintaining the status quo. Set ambitious goals, share them with your team and use them to motivate yourself and to hold yourself accountable. You started a business to grow it – not to maintain it. Ambition does not mean outrageous. Make them possible, but make them ambitious. When people find something they are good at (especially if others notice it and praise them for it) they tend to keep returning to the same activity. This is great for becoming a specialist in one specific area, but being an entrepreneur and business leader means doing much more than specializing. By the same token, let people try new things and experiment with new roles – you never know what hidden talents you’ll uncover. Can you name a single business that was successful throughout the centuries without changing the way it operated? I can’t. Look at your business plan and the way you operate – find one thing that exposes you to a lot of risk and find one thing that may leave you behind if you don’t change it now. Brainstorm ways to improve these areas and see if any of the improvements are viable. Consider potential mistakes that could take a huge toll or technological advances of which you have not yet taken advantage. When business leaders taste the sweetness of success, they want more and more and more. This natural ambition is a fantastic catalyst for growth, so don’t lose it! But you must ask yourself if the actions you are taking now may only benefit you in the short term while proving detrimental in the long term. Don’t let the desire for instant gratification and visible success cloud your judgement. What are some points you would add to these tips to help your fellow entrepreneurs run an even more successful business? 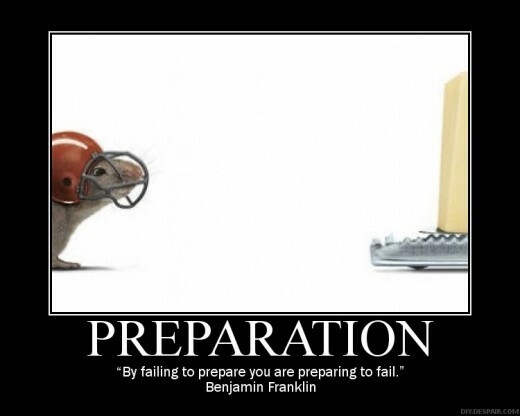 I’ve recently seen some rather poor planning, and I want to take a moment to emphasize the value of preparation. The initial preparation-based document of most businesses is the Business Plan. You know, that document that your angel investor, banker, spouse, partner, etc. wanted to see to make sure that you weren’t totally out of your mind when you told them you were going to start a business that did this, that and the other? The point of that document was, in part, to prepare you for many of the issues that arise over the course of doing business. Do you need special permits or authorization? How much will your operating expenses be the first five years? When do you initially expect to turn a profit? What are your competitors’ barriers to entry or can anyone steal your idea? See? These are questions of preparation. Despite Mr. Bell’s assertion, answering these questions does not guarantee your success, but it’s certainly a step in the right direction. Have you found that your business is flagging recently, that there’s a certain stagnation or that things aren’t headed in the direction you’d hoped? Perhaps things are going well, but you’re about to embark on a huge project. Don’t just flail around grasping at straws and hoping for the best outcome. Do some preparation before you have a crisis and things move too fast for you to adequately prepare. I’ll invoke one of my 10 Ways not to Hire a Guy Like Me: leverage your business plan! That document is probably buried away in saved files – or maybe you put it together before the ubiquity of computers and it’s in your file cabinet, weathered and dusty. Either way, pull it out! Now make an effort to leverage it. What did you say you would do if things turned south? What were your contingency plans? Even if you’re not in this state, updating your business plan for posterity and ensuring that there is a plan in place should something happen to you and your ability to move the business forward is important. Not sure where the business plan is, you don’t have one or it’s not proving helpful? It’s time to rethink your business plan, and use that as a means of preparing yourself to solve your problems before you have a crisis on your hands. Remember the company that thought it was going to move from Minnesota to Orlando over the weekend? That was not preparation. We went in and got them adequately prepared for their move – and it was successful. In order to be successful yourself, I encourage you to spend more time preparing – before anything else. When was the last time you looked at your business plan? You remember, that thing you made so many years ago to ensure that you knew what you were doing and that everything was thought through? Wait, you did make one didn’t you? If so, great – pull it out. If not, I’m not going to ask you to spend your time on that now, but I am going to ask you to think about a contingency plan in case of an emergency. That’s right, the New Year is a great time to review your contingency plan. We’re in the middle of a horrible economy. If things are going well for you and your business, I commend you and say, Keep up the good work. But even if things couldn’t be better, you should always have a contingency plan in place that you update at least every two years. At the cusp of 2012, this is a great time to review and update yours since I’d be willing to bet that you haven’t since before 2009 (pardon my assumptions if you review yours bi-annually). So what should one think about with a contingency plan? The first and most obvious thing is money. Capital is, after all, the life-blood of any business. Without proper cash flow you won’t be able to buy inventory, make payroll or pay your bills. So, do you have a line of credit? If so, is it currently in use? Could you stand to ask for it to be expanded? Do you have good relationships with multiple banks? There are hundreds of banks across the country that are failing but can’t even be taken over by the FDIC because they lack the resources to do so. That should make you nervous if you’re banking at any of them, and it should also make you ask whether or not you can find multiple banks with whom to do business. What assets could you liquidate in case of an emergency? Is there anything non-essential that would fetch a fair value? I’m not suggesting you sell it. I’m only suggesting that you know what you would liquidate and how if you had to. Do you own your business? Are you it’s president? Is there a board? All of this is to say, think about a succession plan. If something terrible happened to you (God forbid, but you never know), can your business survive without you for one month, three months, a year? Is there someone who will take the reins? These questions are especially important to answer if you are going to ask banks for money any time soon. What about your other key positions? Who is indispensable to your operations? What would you do if something happened to him or her? How would you replace that person? Think about your industry and the kinds of emergencies that usually face it. Is it a highly regulated industry? Is it a litigious industry? Are your products safety related? What could go horribly wrong in your industry and business? Think about these things and use your core team to brainstorm potential solutions in case any emergency hits. You never want to be left wondering what you’re going to do in the event of an emergency. As a turnaround manager, I assure you that having a contingency plan in place is essential and a great way to proceed into 2012. Resolve to create or update your contingency plan this month. Consider answering any of the questions I asked above in the comments below and share some of your creative solutions to help others. Optimism is essential to achievement and is also the foundation of courage and of true progress. I certainly can’t disagree with the value of optimism. You need to believe that what you’re doing is going to work or it’s going to be very hard to do anything. So, yes, be optimistic. At the same time, though, all optimism must be supported by realism. Be optimistic by feeling good about a well thought out Business Plan, but make sure you have appropriate contingency plans. That’s realistic. Some say, but contingency plans imply that you don’t believe in your primary plan, and that means you’re not optimistic it will work. Contingency plans are part of the main plan. Having contingency plans should make you optimistic about your primary Business Plan because you know that in the event that life doesn’t work out to 100% of your projections – and it never does – you will not fail. You will have next steps ready to go. So, yes, Butler is right that optimism is essential for progress, but bolster all optimism with realism. What do you think about Butler’s words? Do you have a favorite quote?